Caution! This is a long post, but I’ve tried to make it as detailed as I can, so that others can follow my bad example if they wish. Also, I’ve had all sorts of bother with the photos displaying too big or too small, so if I’ve still not got it right, please accept my apologies! 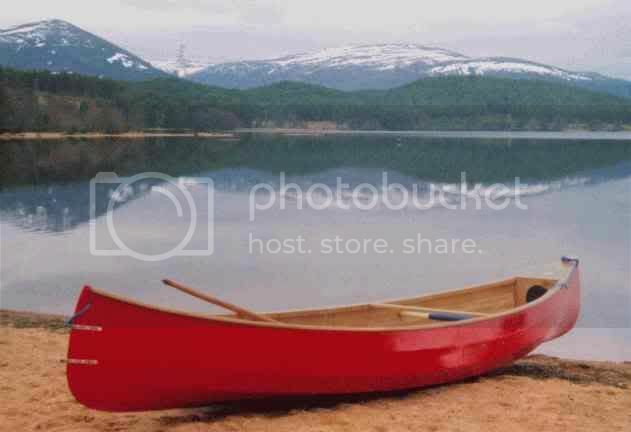 I first had the notion of building a canoe a few years ago, but put it to the back of my mind, where it might have stayed had it not been for our holiday to Canada. Suddenly there were canoes everywhere, and being used for all sorts of things – transport, camping, fishing, sailing, you name it! Of course, when we got back home I started to look into buying a canoe. Now again, I probably should have stuck with this, forked out a sum equivalent to a second hand car for something made of Royalex, and lived happily ever after. However, I’m not quite that sensible, and like so many others it turns out, I found myself surfing the Selway Fisher website. 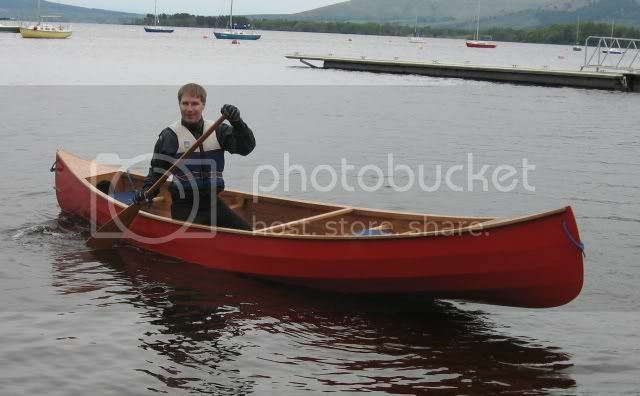 The pics looked great, and suitably enthused by the marketing blurb about building my own canoe in 2 weekends flat, at a cost of no more than 50p, I ordered the plans for the Fisher Prospector. Now, here’s the rub. You must understand at this point that the only thing I’ve ever made out of wood before was a rather fetching egg rack which I made at school (I seem to remember getting a D for that even!). So, this blogg is posted purely to say “If I can do it, so can you”. It is not a tutorial in the finer points of, well, anything really! Right, that’s the scene set, let’s start building! 1) The plans came in the form of two A1 drawings, plus a few sheets of A4 on the building process. 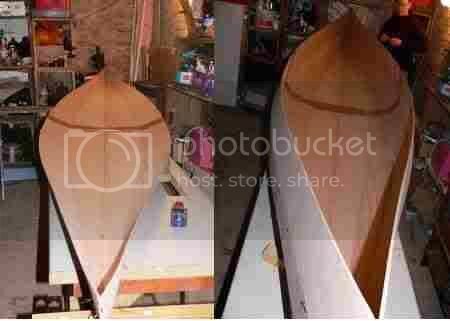 The canoe is symmetrical, with 5 planks per side. This means that you need four of each plank to make the hull. This is made easier by marking out one of each only, and using this as a template for the other three. All four planks can then be planed up together (take your time over this, it’s one of the best bits ). 2) The next job is to join the ends of the planks together to give the full length of the canoe. There are lots of different ways to do this, but I settled for tacking them down on a sheet of sheathing ply, with acetate sheet underneath to stop it sticking. I found that I could lay all of the planks side-by-side along the sheathing ply, so that all of the joints were in the same place. I then primed the join with epoxy resin, and slapped down some 3” glass tape, and waited for this to cure. I was then able to cut the tape between the planks, turn them over, and repeat for the other side. 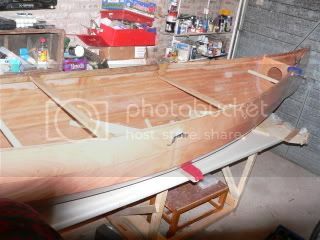 3) Now the fun really starts, as the canoe starts to take shape. 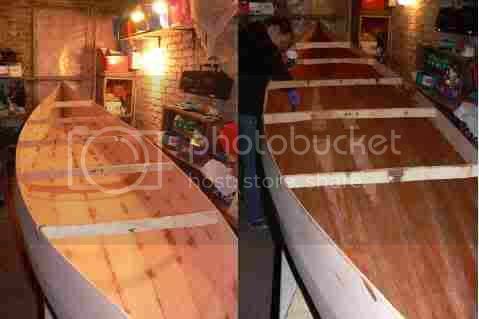 By laying the planks together, and starting from the centre of the canoe, they can be ‘stitched’ together. This is the ‘stitch’ bit of stitch and glue! You can use cable ties or copper wire to hold things together. I went for the wire, and it worked perfectly. The photos below show the hull starting to take shape. Getting to this stage is incredibly quick (2 weekends maybe? ), but don’t open the champagne yet – you’re only 20% of the way there! 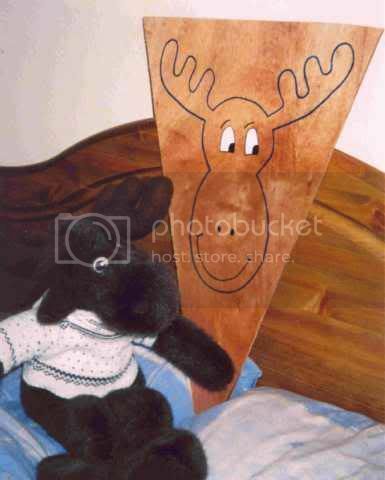 4) Now the ‘moulds’ are inserted to give the canoe its proper shape. I didn’t get a picture of this bit, but basically these are like bulkheads made from scrap ply, which are wired in vertically to give shape and rigidity. It’s then well worth spending time checking that everything is true and to the right dimensions before anything is set in stone (or epoxy). As you can see from the right hand photo above, the bow was distinctly squint to begin with, and needed quite a bit of work to get it to behave! 5) The next job is to tack weld the planks together using epoxy resin, so that the wire stitches can be removed. It is possible to leave the stitches in, and just epoxy over the top of them, but I’m glad I removed mine. I had to leave a few in at the bow and stern, and these gave me all sorts of bother when fairing the hull later, so all in all, I’d recommend the tack-welding, prior to removing the stitches. For the tack-welds, I used a countersink drill bit along the joins to make a small hollow, every 6” or so. I then filled this with thickened epoxy, and it worked a treat. The only drawback is that this method is that it’s visible in the finished job. However, coming back to the egg-rack, I’m not a perfectionist, so it didn’t matter. 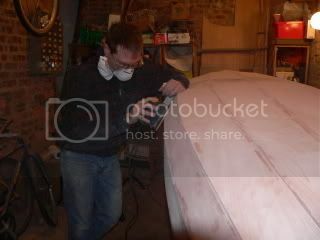 7) Removing most of the moulds leaves the length of the canoe open for the glass taping. First, a ‘fillet’ of thickened epoxy is applied to seal the join, and give a smooth curve for putting the glass tape over. This is quite a tricky task – a bit like trying to apply peanut butter, neatly along a 15’ curve, but with it setting and going lumpy as you go! In hindsight some of my fillets are a bit on the big side, but if anyone laughs at them, I’ll break out the peanut butter and challenge them to do better! I then painted un-thickened epoxy over the fillet, and applied 2” glass tape to the join. This then has more epoxy brushed into it until it is completely ‘wetted out’ (i.e. it goes clear). This is the one place where things went a bit pear shaped, since it was January, and flippin’ freezing in the garage! I think this is what made some of the epoxy go a milky colour, which shows up badly in the final finish. However, you live and learn, and I certainly wasn’t waiting till June to do it in any case. 8) The hull is then turned over, and the gaps where the panels meet are filled with thickened epoxy. When they are first stitched together, this is done so that the inside corners of the ply touch. 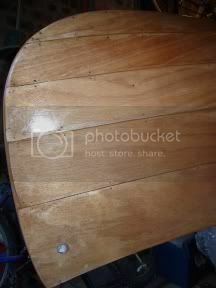 This gives a gap on the outside of the boat, which can be filled to give a nice finish. This was a fairly easy job, but took forever and a day, (laboriously removing the sand from sheet after sheet of sandpaper by hand is hard work!). One tip I’d give is to wait until the epoxy is half-cured, then go at the proud stuff with course sandpaper. It’ll rub off a bit like when you use a pencil rubber. I managed this for a couple of the joints, but by the time I came to the rest, the epoxy had set hard, and needed LOADS of sanding. The problem is that the epoxy is then harder than the wood, so it’s not as easy as it sounds! 9) Just for good measure, I then sealed the outside of the hull in epoxy. This adds rigidity and water protection, so should ensure the boat lasts a long time. I had always planned to paint the hull anyway, but even so, it was quite a wrench to have to say goodbye to all that lovely wood! 10) The next job was fitting the gunwales. This is where the real woodwork began, and I started to struggle! The first problem was sourcing strips of suitable wood. I eventually found a place in Edinburgh who would cut it up for me, but the only wood they stocked in the right size was dressed oak, and opinions were divided on it’s suitability. In hindsight, I should have done the inwales in Douglas Fir, and the outwales in Mahogany or similar, but you live and learn. Anyway, the oak does look lovely! 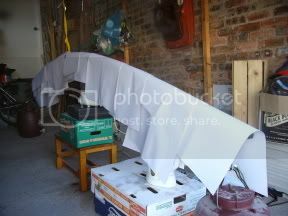 I had a real job steaming the gunwales to fit (here’s a picture of my first, entirely unsuccessful attempt!). I eventually made a steam box from a section of drainpipe, and just about got it to work. The main problem was that the wood only stayed flexible for about 30 seconds once out of the steamer, so lots of swearing and bending ensued. However, I’m now willing to challenge all comers to a G-clamp speed test! Won’t write any more here, but if I ever build another canoe, I’ll need to rethink the right way to do the gunwales and the steaming process! 11) Once the gunwales were on, we were home and dry – just the seats to fit, then some painting and varnishing to finish off. Being a dinghy sailor, I couldn’t contemplate a boat without buoyancy tanks (after all, £5 worth of ply, or £50 for airbags?!). In hindsight, these are less useful than I’d hoped, due to the huge amount of rocker on this boat. However, they do make a neat place for storing sandwiches! The story behind the design is that I asked my wife to come up with something classy – a celtic knot maybe? However, she decided I was taking this boat building lark far too seriously, and looked to a fluffy friend for inspiration. 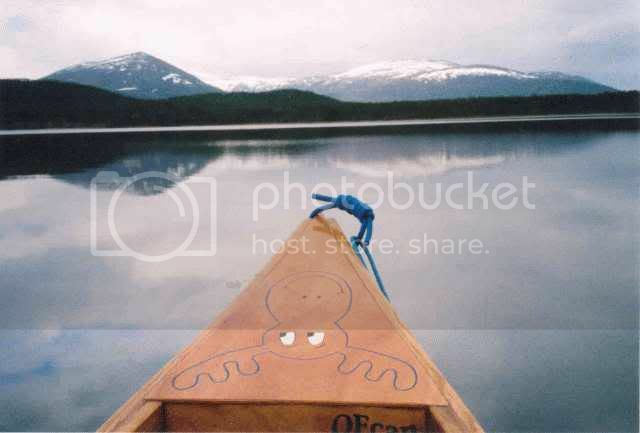 I don’t have a decent photo of this yet, but suffice to say, if the Moose’s head ended up on the bow, you can guess what the stern looks like! Just got to learn how to paddle the darn thing now!